There’s such a big dispute about the origin of the word kebab that’s hard to make any responsible claims. Probably of Persian or Arabic origin, the work kebab meant meat pieces cooked in direct fire, most likely. No matter what the origin of the word kebab itself, I think we could agree that the dish was made known as a Turkish dish and now its name has been borrowed by many languages. Tas means bowl. So tas kebab is meat in a bowl. 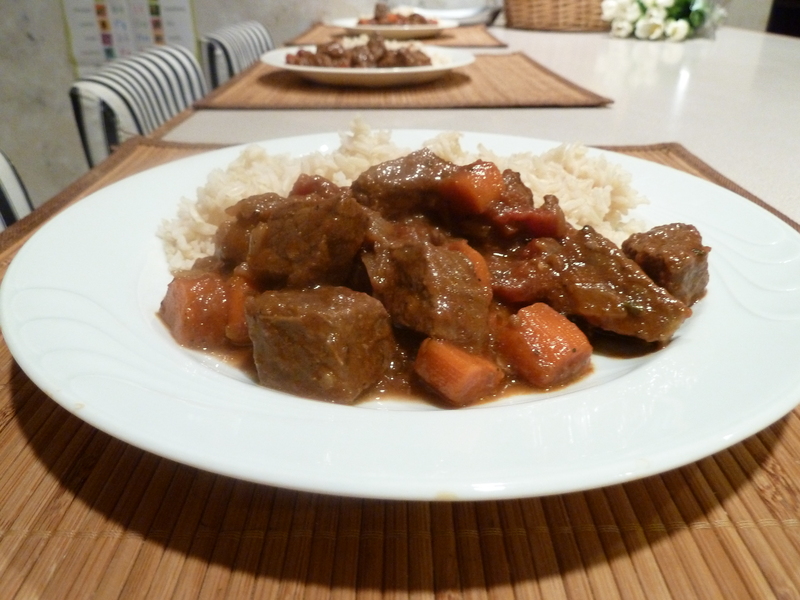 A nice, family dish, most commonly cooked with lamb but beef is fine. Easy to make and the meat comes out tender. I got the specific quantities for the recipe from Xanthi-News and they worked well. How to make: In heavy skillet or pot, heat the oil with half the butter and saute the meat. Once browned, take the meat of the skillet and save in dish. Add the remaining butter, celery, carrot, onions, flour, tomato paste, tomato cubes, oregano, salt and pepper to taste. Let the ingredients warm up and add the wine while turning the heat high. Add the meat and turn the heat back low. Add the beef broth, and cook for about an hour and half until the meat is tender and the sauce has thickened. Serve with pasta, mashed potatoes, or rice. They were yum yum yum! I’m so glad you liked the dish!